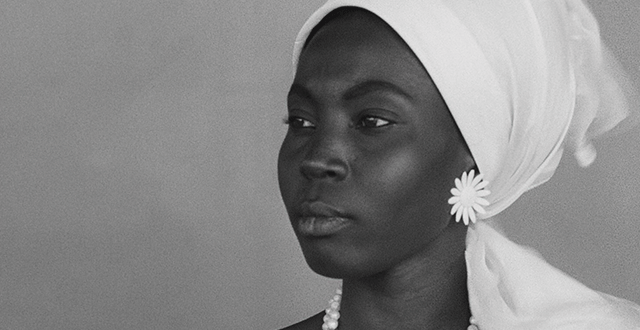 A newly-restored print of Ousmane Sembène's 1966 classic "La Noire de…" ("Black Girl") has been announced as an official selection of the Film Society of Lincoln Center's lineup for Special Events and Revivals taking place during the 53rd New York Film Festival (NYFF), September 25 – October 11. The Revivals selections includes 11 international masterpieces from renowned filmmakers whose diverse and eclectic works have been digitally remastered, restored, and preserved with the assistance of generous partners, including Martin Scorsese’s Film Foundation, celebrating its 25th anniversary. The print was restored by The Film Foundation’s World Cinema Project, in collaboration with the Sembène Estate, Institut National de l’Audiovisuel, INA, Eclair Laboratories and the Centre national du cinéma et de l’image animée, CNC. Films restored by the Film Foundation will eventually be redistributed in theaters, on DVD, Blu-Ray or VOD. At the center of "Black Girl" is Senegalese maid Diouana's plight in Southern France, as it unfolds almost like a documentary, capturing the everyday mundanities of her monotonous life, and the resulting mental anguish she suffers, leading to the film's tragic conclusion. Underneath the deceptively simple story of a Senegalese maid (played by the lovely Mbissine Thérèse Diop), and her relationship with the white French couple she works for, reveals a film rich with symbolism and complexities that are essentially reactions to, and analysis of, the cultural legacy of colonialism - a recurrent theme you'll find in much of Sembène's work, as well as commentary on the untapped strength and abilities of African women. A restored print of the film is more than welcomed, and I'm sure it'll continue to travel. Other film masters of yesteryear whose restored works will be feted in the festival's Revivals section this year include Akira Kurosawa, Brian De Palma, Hou Hsiao-hsien, King Hu, Manoel de Oliveira, and more.